NYMEX WTI is trading 2% higher, jumping above the $60 barrel. 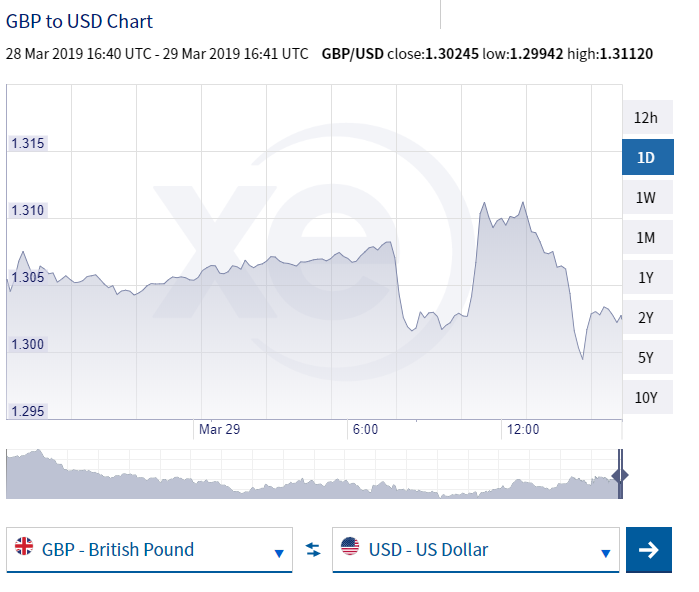 The British Pound remains as volatile as ever. Today, the MPs gathered again to hold a third vote on the Withdrawal Agreement in a bid to extend the departure date to May 22nd. The vote fell by a 344 noes to 286 yes votes. The situation remains confusing for the market and each passing hour adds to even more uncertainty. GBP USD hit a low of 1.29942 before recovering to 1.29942. Opposition Leader Jeremy Corbyn called for PM May to step down and call a General Election. London police were putting security barriers and safeguards in place in case demonstrations turned violent. The Dollar Index dropped after real personal consumption expenditure (PCE) grew at a slower pace than market estimates. The greenback is now heading towards a three-day low vis-à-vis most major currencies. WTI is up nearly 2%, holding above key $60 a barrel. Investors now turn their attention to Chicago PMI and consumer sentiment for further trading impetus. The British economy slowed with the gross domestic product (GDP) at 0.2% in Q4. Investment from the business community declined for the fourth consecutive quarter. Also, housing prices increases remain subdued, and recorded a meagre 0.2% increase in March, according to the latest UK Nationwide HPI. Consumer confidence is very low, deciding to postpone any long-term investment until there is clarity on the ongoing UK-EU exit. Today was supposed to be Brexit day, but for now it has been extended until April 12th. Calls for PM May's resignation and a general election are resonating loudly. EUR/USD is trading in a tight range despite some good numbers trickling out of the German economy. Data released earlier today showed retail turnover for February moving 0.9% higher compared to the prior month. Also, during the same period, the Import Price Index rose by 0.3%. The market is now waiting nervously for a new vote on the Brexit Withdrawal deal. The Canadian real gross domestic product (GDP) surprised the street after the latest reading showed the economy expanded 0.3% in January, reversing the fall from the prior last two month. The growth was broad-based with manufacturing sector rising 1.5%. Strong home data and strong crude oil are attracting bids at the expense of the US dollar. 18 out of the 20 industrial sectors recorded growth sending the CAD to its strongest level in a week. Whilst the market is cautious of global economic slowdown, this incoming data was welcomed with a bit of a surprise. The AUD USD pair saw some early buys and rose 0.7105 before fading to 0.70955 on a quiet day following New Zealand's announcement of a hold on insurance rates. The US dollar is standing firm against the Japanese yen following mixed data from Japan. Retail sales were soft, growing 0.4% on the year, inflation still timid, whilst the unemployment rate fell to 2.3%, below market estimates of 2.5%. The yen strengthened on the data but then lost all gains as moods swung to risk on sentiment.